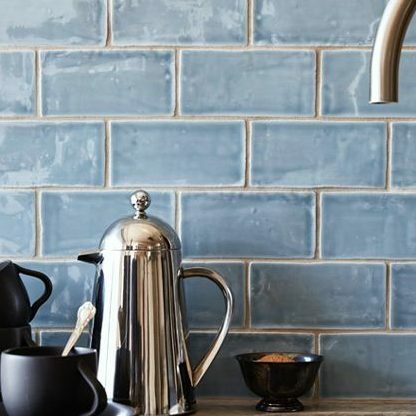 Kitchen Backsplashes have seen a huge resurgence over the last few years and for good reason. They serve a useful function while providing a great accent to your kitchen. From traditional to contemporary, we are going to take a look a some popular backsplash designs and materials to give you an easy guide to choosing your next style! Subway tile is the default go to for a lot of reasons. It’s timeless, versatile, easy to clean, and can be found very inexpensively. 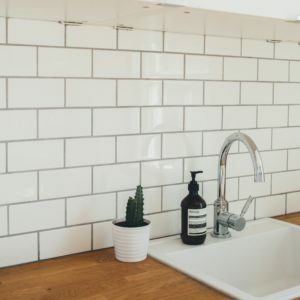 Subway tile has an understated quality about it and can change the way it comes across simply by choosing different grout colors or spacing options. It’s clean lines and easy function mean subway tile has lasting appeal and won’t easily leave your kitchen feeling dated. Natural Stone comes in a variety of different stone options and has a decidedly modern look with a classic touch. Usually installed with different thicknesses of stone to give a rustic cobbled look to the finished backsplash, natural stone tiles can give a great feeling of depth to your kitchen. Depending on the stone you choose, it can run a little more expensive than a ceramic tile and may need slightly more maintenance due to it’s uneven texture but the charming look of natural stone is hard to replicate with any other material. Mosaics are a very popular choice because of how extremely versatile it is. Coming in a wide variety of patterns, materials, and colors, mosaic tiles can be a wonderful accent for almost any kitchen. Mosaics can be made with stone, glass, metal, ceramics, or a combination of all of them. The mixture of textures and color can help break up repetitive grout lines or accentuate a pattern in the design. Pricing for mosaics can vary depending on the materials and style meaning backsplashes can range from very affordable to super luxurious. Glass tiles are clean and modern with a translucent depth to them that really stands out. 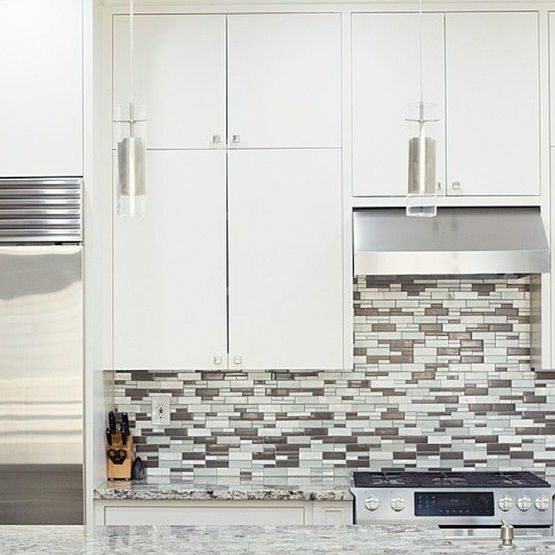 Glass backsplashes can come in a variety of sizes from smaller tiles that mimic the look of subway tile with a modern twist, to large glass sheets that can cover your entire backsplash with a single unbroken sheet of glass. Under cabinet lighting works very well with glass tile as the light is able to reflect off of the surface and help illuminate the area. The nature of the glass surface also means that it is one of the easiest materials to clean and requires low maintenance. 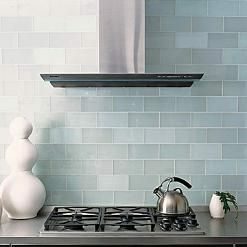 The price for glass tile is often more affordable than people expect and the statement it gives off is stunning. Metal backsplashes have been around for quite a while and give a classic look to the space. 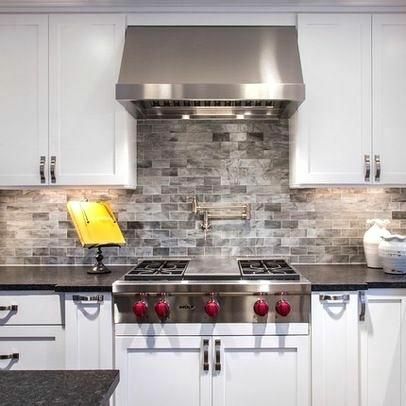 Coming in a variety of finishes, you would be surprised at how well a metal backsplash can complement your kitchen. 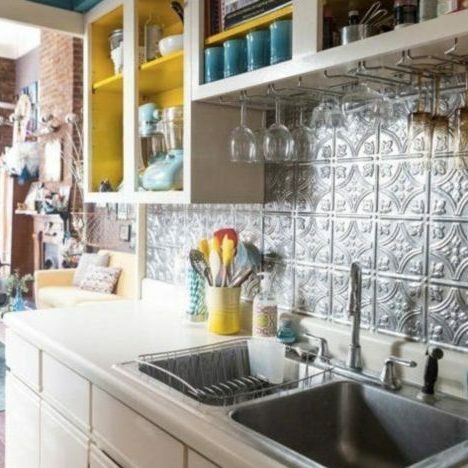 Truly designed to last, a metal backsplash can last a lifetime if treated properly. You can find it in a wide selection of patterns and designs often with an classic old world feel. They are easy to clean and very durable. Clay Tile may require some love and attention but it is hard to match it’s charming and sophisticated look when done properly. Clay tiles can come in a variety of finishes such as brick, glazed, or chevron. The rustic, hand crafted look of clay tiles really give a sense that the space was carefully crafted with purpose. Glazing can add a wonderful variety of colors to the tile and the individually made pieces can lend a feeling of personality to your kitchen backsplash. Clay Tiles are lovely but do require more maintenance than other tiles. They may require sealing from time to time because of the porous nature of the material and even glazed tile is often unsealed at the edges so an eye should be kept on it for when the next sealing is due. That’s right, wood! I bet you didn’t see this one coming. This natural material embodies the term rustic. Wood backsplashes can come in rough finishes or smooth heavily glossed finishes. Wood is very versatile and can help give off a feeling of warm country living or quiet gracefulness. 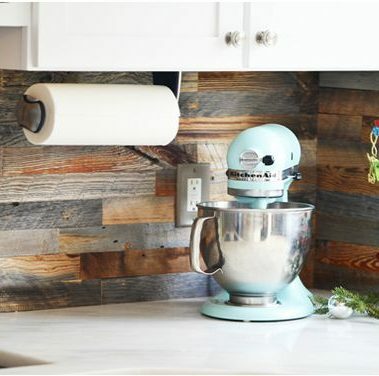 The ability of wood to be easily cut into any shape means that you can find wood backsplash materials to fit any look. If properly cared for, wood is surprisingly long lasting. Because of the porous nature of wood, you will want to make sure it is regularly sealed and looked after. Just like a good hardwood floor, a wood backsplash can stay beautiful for a very long time when treated with love.